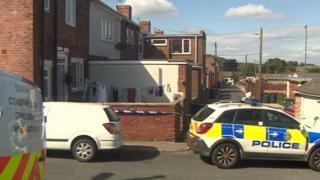 A man has been stabbed to death in a County Durham village. The 25-year-old was killed “following an incident” in Gregson Street in Sacriston, near Durham City, at about 23:00 BST on Saturday. Durham Police said it was an isolated attack and there was no greater threat to the community. A 25-year-old man has been arrested on suspicion of murder. A woman, 25, has been arrested on suspicion of assisting an offender. The man is in custody at Peterlee and the woman at Darlington. The victim was pronounced dead at the scene and his family are being supported by specially trained officers. Det Insp Lee Gosling said there will be increased police patrols and a cordon will remain in place as inquiries continue.